Your skin is the body’s largest organ and its condition is an indicator of your overall health. Healthy skin starts from within and proper nutrition is crucial to your looks and well-being. Eating a balanced nutrient rich diet based on fresh organic produce, combined with moderate exercise and a positive outlook on life will contribute to a glowing, radiant complexion. If your skin is looking tired, sallow and prone to spots, you might wish to consider a detox. The health of your digestive system, your liver, the acidity of your blood and the way you breathe all affect your health and your looks. Drink plenty of fresh pure water throughout the day and increase your intake of dietary fibre and essential fatty acids. Care for your digestive tract – it not only assists the removal of toxins, but it also releases vital energy for healing and elimination. What you put on your skin can also affect your inner health. It is now known that up to 60% of what comes into contact with the skin may be absorbed and can enter the bloodstream, from where it is transported to every organ of the body. Many ingredients used in mainstream cosmetics and personal care products are toxic to living cells – examples include ethanol, synthetic perfumes, and many preservatives. The same applies to household cleaning products, many of which contain potentially toxic ingredients. There are a number of factors that limit the choice of ingredients that can be used in organic skin care products, which makes it difficult to create totally organic formulations. Currently, only salves, butters and balms can be 100% organic. These products contain plant based oils, waxes, essential oils and nothing else. As they don’t contain water, they don’t need preservatives – but consumers may find them heavy and greasy. Water is the main ingredient of most skin care lotions and creams, accounting for as much as 75% of the total. It may be listed as ‘aqua’ (Latin for water) or indicated by ingredients such as aloe vera juice, herbal infusions, seaweed extracts or floral waters. 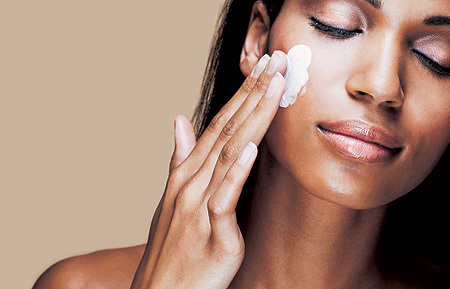 Lighter skin care products such as creams and lotions are more complicated to formulate as water and oil must be held together by an emulsifier. In addition, any product containing water needs a preservative to prevent it becoming contaminated with micro-organisms. Emollients are the oily or fatty part of the emulsion. Emollients prevent dryness and protect the skin, providing lasting lubrication and softening. Natural emollients such as plant oils and butters are soluble in sebum, and easily absorbed and utilised by skin cells. They are readily biodegradable, available as organic ingredients and are of edible quality. Most high-street skin care products are synthetic emollients such as mineral oils (paraffin wax and petrolatum) because they are cheap and stable. Mineral oils simply coat the skin, which stops the skin breathing and can cause irritation. Other synthetic emollients include silicones (methicone and dimethicone). Like mineral oils they can inhibit the skin’s ability to release toxins and may cause irritation. They are also non-biodegradable. Skin creams are designed to keep skin moist and so must have humectant properties to retain skin moisture. Humectants draw and hold onto moisture from anything around them. Collagen, elastin and keratin are widely used humectants as they are compatible with the skin and deposit a protective film. However, they are usually sourced from animals, and so most consumers prefer to avoid them. Glycerine and lecithin are natural, plant-derived humectants. Glycerine, the most common, is derived from oils and fats made during soap-making. Natural phospholipids such as lecithin are excellent humectants as they increase skin hydration without forming a coating and so allow the skin to breath. Synthetic humectants such as propylene glycol can cause irritation and should be avoided. Detergents are foaming emulsifiers found in shampoos, shower gels and soaps. They’re designed to emulsify oily grime, keeping it in liquid suspension until it is washed away. Because all detergents emulsify oils, they can remove sebum, leading to dry skin. They can also interact with cell membranes – causing irritation. Some detergents are more irritating than others. 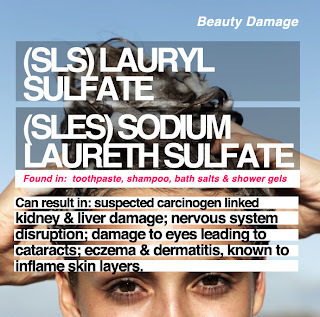 Harsh detergents such as sodium lauryl sulphate strip away natural protective oils, leaving the skin dry and inflamed. Milder detergents such as coco betaine and decyl glucoside are less irritating and are more suitable for sensitive skin. Natural, nutrient rich colours can be found in avocado, pumpkin seed oil or chlorophyll (green), azulene from chamomile (blue) and rose hip or calendula oils (golden orange). These colours are not as vivid and vibrant as those from synthetic colours and may change or fade with exposure to light and oxygen. Avoid synthetic colours: they are used to make products look more appealing to consumers, but they can cause allergic skin reactions. Some contain heavy metals and may be carcinogenic. As much as 95% of the ingredients in the fragrances or perfumes used in skin care products are synthetic. Fragrances are a major cause of allergic reactions. Blends of pure, natural essential oils provide a pleasant fragrance, but with added therapeutic properties. Scents made with natural ingredients may cause skin irritation, but you are less likely to suffer allergic reactions than with synthetic fragrances. Just like food, all natural skin care products eventually deteriorate and become unfit for use. Most cosmetics contain preservatives to prevent bacterial and fungal contamination during their intended shelf life. Preservatives are a leading cause of allergy and irritation. In particular, the following can cause allergic reactions or irritation, or may act as a donors of formaldehyde, a known carcinogen and neurotoxin: Methylchloroisothiazolinone, Methylisothiazolinone, 2-bromo, 2-nitropropane-1, 3-diol, diazolidinyl urea, DMDM hydantoin, imidazolidinyl urea, quaternium 15. Parabens (including methyl, propyl, butyl and ethyl pareben) are commonly used as preservatives in personal care products. Although parabens are found in nature, they should be used with caution because they can disrupt hormone levels. Research from the University of Reading published in 2004 found higher than normal levels of parabens in tissue from breast tumours. Research published in 1998 showed that butylparaben is the most POWERFUL of these oestrogen-mimics, while propylparaben can REDUCE sperm production. Derived from sheep’s wool, lanolin itself is perfectly safe and may be beneficial to the skin. However, cosmetic grade lanolin can be contaminated with carcinogens, such as the pesticide lindane, and organophosphates, which have been linked to central nervous system disorders. The cosmetic talc found in baby powders, face powders, body powders and some contraceptives is carcinogenic. Inhaling talc and using it in the genital area is associated with an increased risk of lung and ovarian cancer respectively. Talc should never be used on babies, both because of its carcinogenicity and due to the acute respiratory distress from inhalation that can result in death. In conclusion, it is no wonder so many people are getting cancer. The majority of people have been using toxic chemicals since they were little. If you are skeptical about what you have just read, I recommend you do your own research and find out for yourself if all of this is the truth or just plain paranoia.